TheGunBlog.ca — The Canadian Association of Chiefs of Police, a lobby group and supporter of the Coalition for Gun Control, will update its position on firearms as the government prepares new bans aimed at licensed hunters and sport shooters. The group has a history of lobbying for restrictions on private gun owners even though many active and retired officers use their personal firearms for hunting, plinking and competing. The CACP supports Bill C-71, which includes prohibitions and measures for future bans, as well as more constraints for licensed owners to buy, sell or transport firearms. But in early August, the group’s newly elected president, Adam Palmer, joined other police leaders in rejecting new seizures of firearms from licensed owners vetted by the federal police. Police are on the front line of enforcing bans. The CACP decided to update its views on guns at its annual conference in August a week after the Globe and Mail reported the government may end handgun ownership by licensed individuals. The CACP is inviting members to volunteer for the special committee or to nominate others. A spokeswoman wasn’t available when TheGunBlog.ca called for more information. Dennis Young, a gun-rights advocate and former officer with the Royal Canadian Mounted Police, shared the CACP news bulletin with TheGunBlog.ca. More than 90,000 Canadians, mainly police, are authorized or required to carry loaded guns on their person for personal and public safety. Millions of others use firearms for hunting or sport. More men and women have a federal firearm licence than play hockey. On Aug. 28 the prime minister asked Minister Bill Blair to examine a “full ban” on lawfully owned handguns and what he called “assault weapons,” which some people view as any automatic or semi-automatic rifle or shotgun. All firearms are banned already for anyone without a licence. None of the government’s planned new prohibitions and restrictions is aimed at criminals or gangs. The Liberal Party won a majority of seats in parliament after campaigning on plans it later proposed as Bill C-71. A public-relations firm that advises the government said in March the Liberals could win more votes by further limiting gun rights. 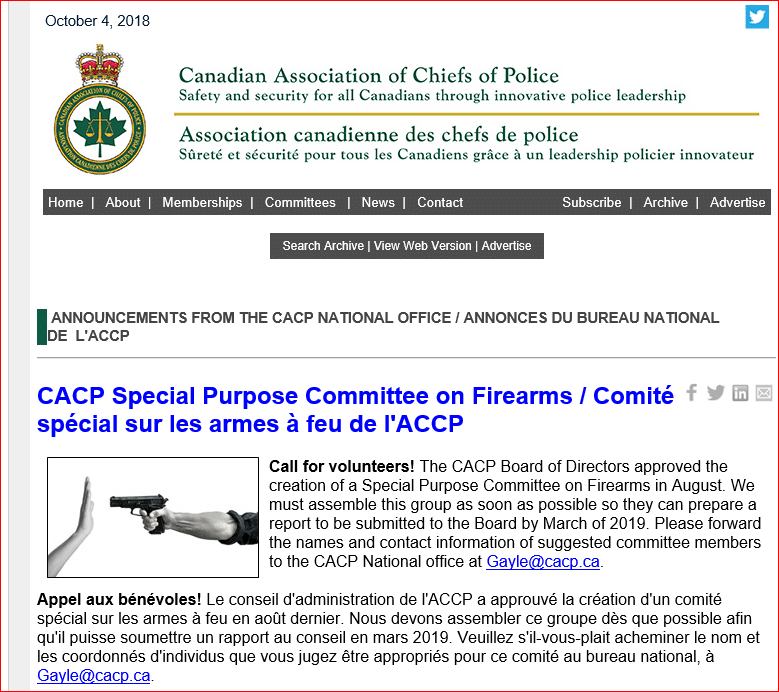 The Coalition for Gun Control has listed the Canadian Association of Chiefs of Police as a member. Its website features several quotes by Blair and other police leaders and lobby groups. The CACP supports Bill C-71, which will immediately prohibit and eventually confiscate as many as 15,000 rifles, and also facilitate new bans. See Presentation to House of Commons committee studying the proposed law. Bill C-71 includes measures to force gun stores to record details of licensed firearm buyers and the guns they purchase, as recommended by the CACP. It is illegal for anyone to buy, sell, own or transport any firearm without a federal Possession and Acquisition Licence. The Conservatives didn’t change that. They eliminated a step that required licence holders to obtain additional police permissions to transport certain firearms. The CACP developed a National Firearms Policing Strategy in 2010 to oppose government plans to end the so-called “Long-Gun Registry,” a costly database designed to track licensed gun owners and their guns. “We support the licensing of firearms owners as well as the registration of all firearms.” — 2010 statement by the CACP with the Canadian Association of Police Boards (CAPB) and the Canadian Police Association (CPA). Read CACP’s presentations to committees studying the “long-gun registry” in the House of Commons in November 2011 here and to the Senate in March 2012 here. Follow up to the Senate in June 2012 here. Like staying in the know? Please support us so we can continue supporting you.